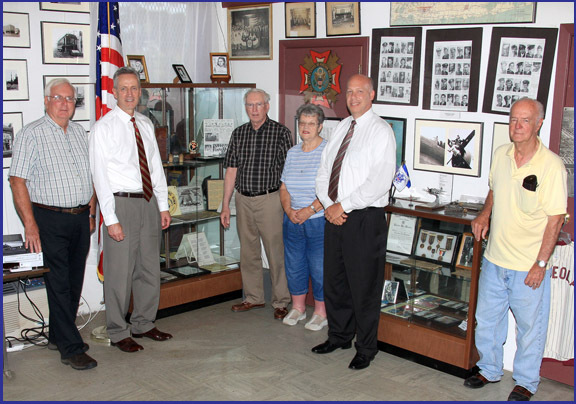 Working with the members of the Mineola Historical Society and Village of Mineola Mayor Scott Strauss, Legislator Rich Nicolello recently secured $3,200 in Nassau County grant monies for the Village’s Museum. The Historical Society used the funds to purchase decorative display cases and bookcases to house the Museum’s artifacts. The Village of Mineola’s Historical Society Museum is located across from the Village Pool on Westbury Avenue and contains a collection of historical photos and other items which help tell the history of the Village. Shown in the attached photo from left to right: Historical Society Treasurer Michael Marinak, Nassau County Legislator Rich Nicolello, Historical Society President Tom Murtha, Historical Society Vice President Dolores Mangold, Village of Mineola Mayor Scott Strauss, and Village Historian Neil Young.